We believe these two may have simply made an innocent mistake, but it’s unfortunate that people believed it and shared it (hundreds of retweets and favorites on Twitter, and various shares and praise on message boards, etc.). The University of Minnesota had 25 teams subject to APR reporting for the APR period (4-year period) ending with the 2012-13 academic year. Of those 25 teams, 12 of them (or 48% of their teams) received public recognition awards from the NCAA. Public recognition awards are given to the teams with a top 10% APR score (4-year) in each sport. 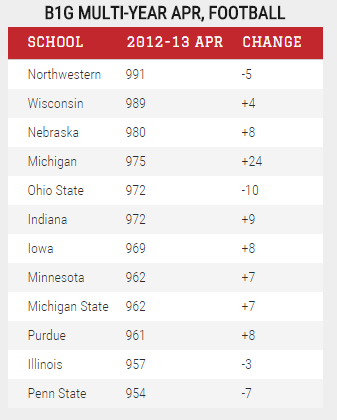 The University looked at all institutions that have an FBS football team and their research showed that, within that population of schools, the 48% mark put them at #4 in the nation for the four year APR period ending in 2012-13, behind only three private schools. The football team was not one of the 12 teams given an award. Their APR score for that period was 962. It’s a solid score and placed them ahead of three other Big Ten programs (Penn State, Purdue and Illinois). It appears the recruiting coordinators got confused by the difference between “FBS institutions” and “FBS football teams” as well as the years included in the data. 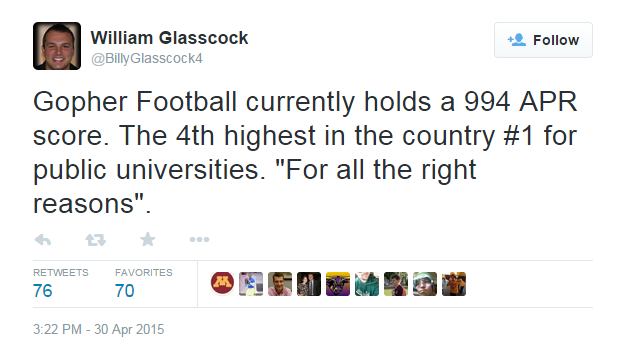 Now, make no mistake – Minnesota football’s single-year APR scores for the 2011-12 and 2012-13 academic years were 994 and that’s very good. In 2012-13, only one FBS team had a perfect single-year score (Teddy Bridgewater and the Louisville Cardinals) and only one other Big Ten team had a score as good as the Gophers’ (uw-madison, also 994). Is it “current?” That’s debatable. 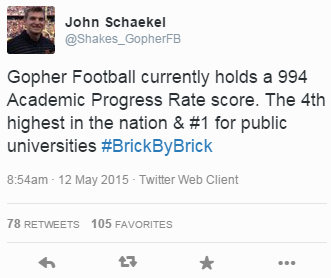 Minnesota reported their 2013-14 scores in the fall of 2014. We may choose to share those in due time and the NCAA will release data for all schools in the coming weeks. 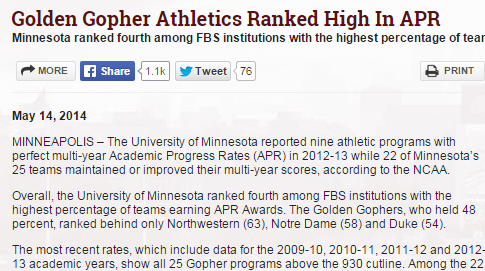 Was Minnesota football’s single-year APR in 2012-13 the best among public universities? Absolutely not. Was it the fourth-best in the nation? No, it wasn’t. It was very good, however.